The CD152 antigen, also called CTLA4, is an integral membrane protein belonging to the immunoglobulin superfamily, which is expressed either as a 30 kDa monomer or as a disulfide-linked homodimer. It has homology with the T cell antigen CD28, and like CD28, is a ligand for CD80 and CD86. CTLA-4 is transiently expressed by activated T cells and is not detectable in resting T cells. CD152 and CD28 are involved in the costimulation required for T cell activation. 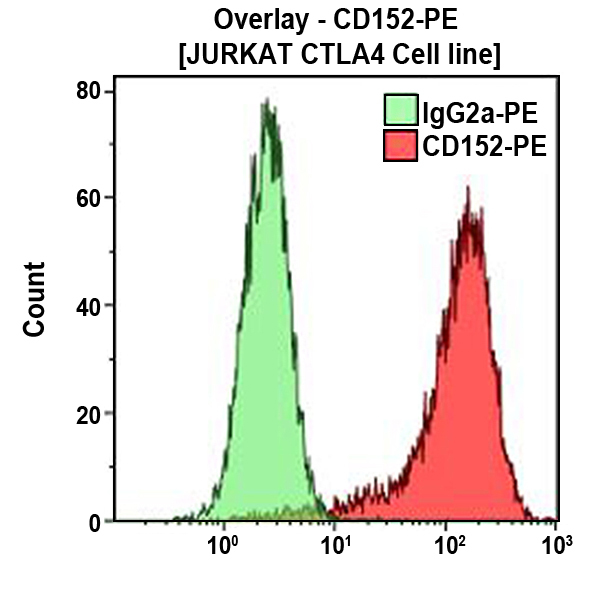 Clone Description The BNI3 antibody can be used to detect intracytoplasmic CD152 (CTLA4) by flow cytometry after permeabilization with IntraPrep Permeabilization Reagent.